When you stay on The Queen Mary, a historic cruise ship, you travel back to the days of the grand ocean liners — without ever leaving port. Built in Scotland for the Cunard Steamship Company, the Queen Mary was originally designed to carry 1,957 passengers. 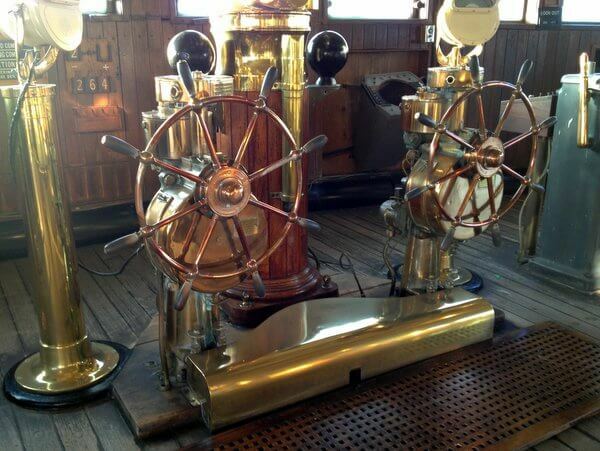 From the ship’s first sailing in 1936 until she was retired in the 1960s, she crossed the Atlantic 1,001 times. 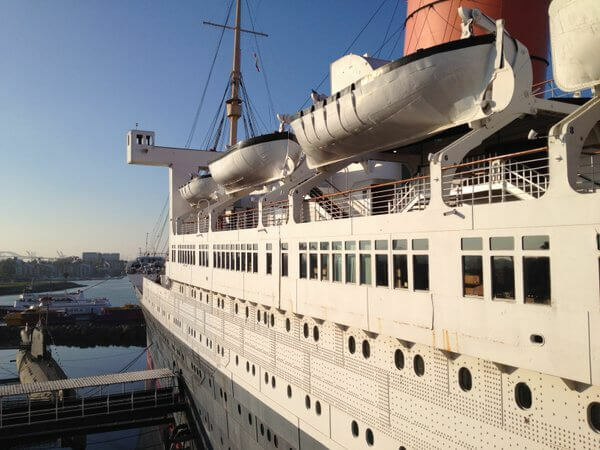 Since 1967, the Queen Mary has been docked in Long Beach, California, just south of Los Angeles, where she’s open to the public for tours, meals, and special events. The ship is also a 346-room floating hotel. 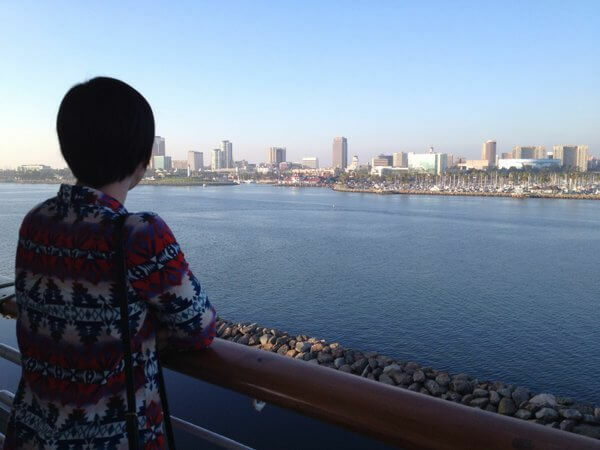 My daughter and I spent two nights on the Queen Mary earlier this year during a California holiday. When she learned that the ship is supposedly one of the 10 most haunted places in America, that sealed the deal. My daughter was thrilled with the idea of staying in the company of ghosts. The Queen Mary has several different types of guest rooms. 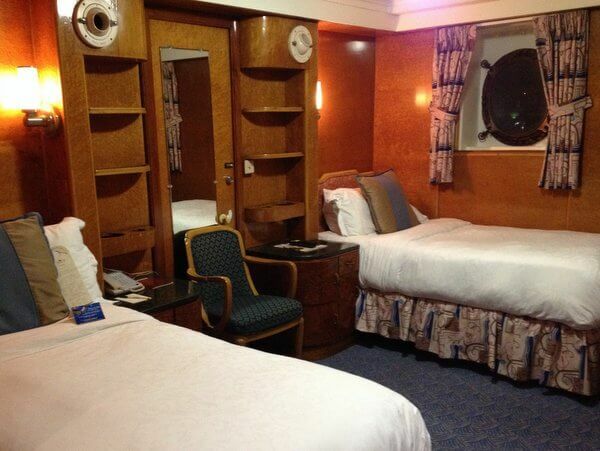 The least expensive are the Inside Staterooms, which have no windows. We opted instead for the “Deluxe Stateroom” (above), with polished wood walls and porthole windows overlooking the harbor. These rooms come with either one king or two twin beds. Even with present-day amenities like a flat-screen TV and free Wi-Fi, we could definitely imagine ourselves as ocean-going passengers from years past in our Art Deco-style room, with its black stone countertops and curved arm chairs. 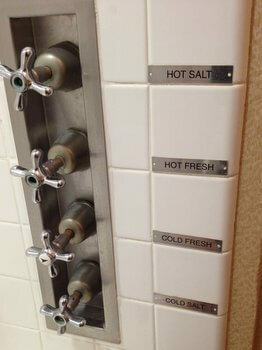 Our bathroom retained the original (but no longer functioning) water taps labeled Hot Salt, Hot Fresh, Cold Salt, Cold Fresh. Despite the ship’s pedigree, a stay on the Queen Mary is definitely not a “luxury” experience. The ship has a small fitness room available to guests as well as several restaurants (including a Starbucks cafe), but compared with more modern hotels, even our deluxe room, while cool-looking, was pretty basic. Our main complaint was that sound travels – quite loudly – between the rooms. We weren’t bothered by noise during the night (nor did we sense any ghostly wails), but when the couple in the adjacent cabin awoke at 7am and began planning their day, we heard every word. You might bring earplugs if you’re a light sleeper. Double room rates on the Queen Mary typically start at $129/night, rising to more than $200/night during the busy summer season. We found a mid-week, mid-winter discounted rate of $90, which seemed like an excellent deal. 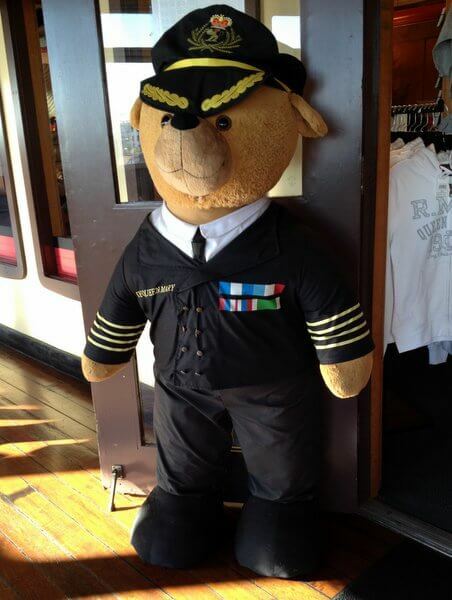 Whether you’re staying overnight or just visiting the ship, you can choose from a number of different guided tours. Despite our interest in ghosts, we passed up the hokey-sounding “Ghosts and Legends” tour, which staff described as primarily a special effects experience. Instead, we chose the one-hour “Haunted Encounters” historic tour. We followed our guide into the bowels of the ship, as he told us something of her history and pointed out locations where ghosts and other paranormal events supposedly tool place. We didn’t see anything ghostly, but it was a little creepy to look at the ship’s old swimming pool, long since retired, and hear stories of passengers who had drowned or met with foul play nearby. After our tour, we enjoyed wandering around the ship on our own. Guests have pretty free rein to explore, so we walked up and down the various decks and corridors and up to the engine room, which still looks much as it might have back in the ship’s prime. When you stand on the decks of the Queen Mary, looking out across the water, you can almost imagine that you’re setting off to sea. Because when your kid tells you you’re cool, that’s almost as rare as seeing a ghost. Make reservations directly with The Queen Mary online or go to Hotels.com.